This month one of our instructors, Michael Wurth, who recently returned from a trip with youth to the Boundary Waters, wrote something to share with you about their experiences. We hope you enjoy reading his story, we know we did! 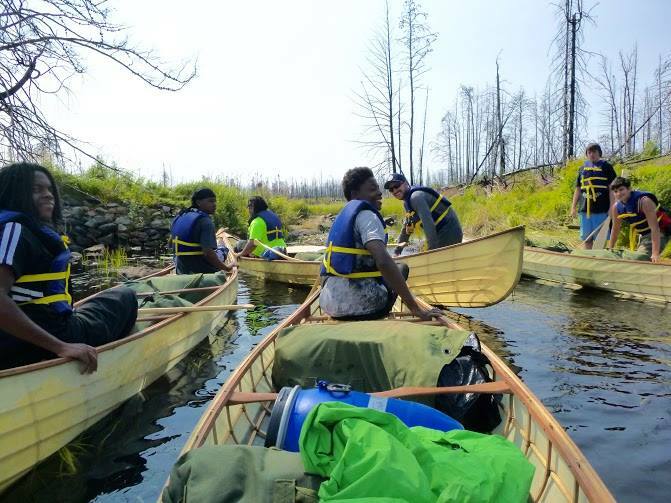 In late August, two adult instructors and six youth traveled to the Boundary Waters Canoe Area for a four night, five day adventure. Their mission was to test the durability and strength of the boats they crafted, while exploring a new part of the state they had never before witnessed. For three youth, this was their first time ever camping! As the crew headed north to Tofte, there was excitement and many questions. How are we going to get drinking water? What will we be eating? Are there bears? Are there snakes? Are there sasquatches? We made it to Lake Kawishiwi around 2:00 p.m. and upon arrival, Mother Nature had her first test – 57 degrees, rain, and an 18 mph headwind. Everyone looked around as if this was a bad joke, but after rallying morale and determining that we were going to paddle across the lake and find a campsite straight away, we set off. It was a muscle-aching challenge coupled with wind-blown rain, but after reaching the shore of our first campsite, energy was as high as if we had just completed a triathlon. The weather ceased and we enjoyed a nice fire and a hearty meal. The rest of trip brought other challenges, like portaging with food and gear for eight people, but brought far more rewards. On the third day, we witnessed a bald eagle hunting a fish too large for its powerful talons. The eagle swam it to shore (eagles are apparently great swimmers! ), and then was courted by another eagle. This incredible experience ended with what looked like a well-practiced ballet routine, with the two eagles locking talons high in the air and twirling all the way down until they were about five feet from the water. They then broke apart and flew off together. Everyone was silent, and it was a great experience to share with young people who had rarely spent more than an afternoon in the woods. Overall, the experience had lasting impressions on the youth. Everyone was exhausted after a busy week, and surely enjoyed a hot shower and good night’s rest. The following week, Apprentices began work at the State Fair, and the stories of their adventure were being told to volunteers and other Apprentices. It was apparent that Apprentices had more pride in the boats they had built, and relished the long-lasting memories that were made in them. Success at the State Fair! For the second consecutive year, Urban Boatbuilders set up shop at the Minnesota State Fair outside the Department of Natural Resources historic fairgrounds building. Fairgoers watched our Apprentices build a Wilderness Traveler canoe over the Fair’s 12 days, which was the prize of a drawing fairgoers had the opportunity to enter. Our volunteers led a lashing activity so that visitors got to try their hand at boatbuilding as well. The State Fair was a huge success for Urban Boatbuilders – we were able to connect and engage with tens of thousands of fairgoers. Apprentices were surprised on the very first day of the Fair by a visit from Saint Paul Mayor Chris Coleman, who brought Minneapolis Mayor Betsy Hodges to our exhibit. Mayor Hodges learned from the youth how to use a spokeshave to craft a yoke. We’d like to once again thank everyone who came to see us and engaged with our Apprentices and Volunteers, and congratulate the lucky Kayleigh B., who won the canoe our Apprentices built during the Fair. We hope to see you all again next year at the 2016 Minnesota State Fair! Last week, reporter Maja Beckstrom of the Pioneer Press paid a visit to the Urban Boatbuilders workshop, seeking to feature the organization in an article. She found our Apprentices hard at work in the shop, and talked with them, as well as instructors, about how they had found the organization and the work they were doing there. Among the Apprentices interviewed was Lawayne, who told Beckstrom that when he got his first paycheck, he gave each of his sisters 100 dollars for school clothes. Another Apprentice, Joe, told her "Craftsmanship to me is being able to fix your mistakes," while painstakingly analyzing and re-lashing a skewed canoe rib. Many other stories and quotes painted an excellent picture of the good work the organization is doing, and the benefits the youth receive from being a part of it. Urban Boatbuilders couldn’t be happier to have an opportunity for the community to get a snapshot of our Apprentices and the work they’re doing. This article appeared in the Saturday, September 19th issue of Pioneer Press. An online version of the article can be found here.